Well, the showdown has arrived. CNN is officially suing President Trump to let favorite punching bag Jim Acosta out of the doghouse. 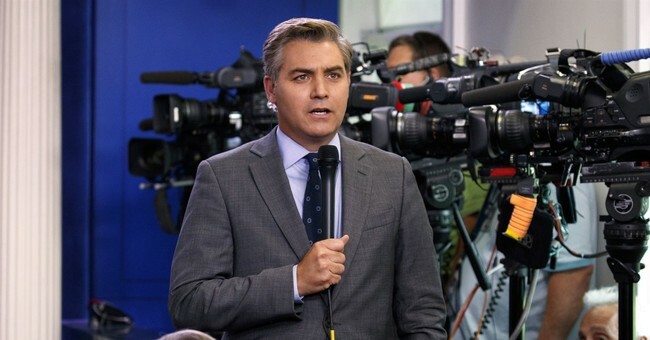 Acosta had his White House press credentials revoked after a testy exchange with the president after the 2018 midterms. The network’s chief White House correspondent refused to give up his microphone in the exchange, as a White House intern tried to grab it. The Trump White House then used that supposed altercation as cause for his credentials to be revoked. Frankly, these credentials are not entitlements. It’s not a right. They could have just yanked them because Acosta is a mouthpiece for the Democratic Party, who carries himself as a 40-year-old member of a high school debate team. BREAKING: CNN sues President Trump, demanding reporter Jim Acosta's return to the White House. The fireworks went off last week when Acosta took issue with Trump describing the illegal alien caravan heading towards the southern border as an "invasion." The unusual lawsuit, an escalation of Trump’s longrunning war of words with CNN, seeks a judge’s intervention after Trump banished Acosta from the White House grounds for an indefinite period after a brief altercation between Acosta and a White House press aide. After a testy exchange between the president and the reporter, the unidentified press aide went up to Acosta to take a microphone out of his hands. As a result, press secretary Sarah Huckabee Sanders announced a few hours later that the White House had revoked Acosta’s “hard pass,” which enables reporters to enter and leave the grounds each day. CNN filed suit in U.S. District Court in Washington. “We have asked this court for an immediate restraining order requiring the pass be returned to Jim, and will seek permanent relief as part of this process,” the network said in a statement released Tuesday morning. “I think it’s a really strong lawsuit,” Floyd Abrams, a noted First Amendment lawyer, told CNN on Sunday. “I think [CNN] should sue, and if it’s not about Acosta, this is going to happen again...So whether it’s CNN suing or the next company suing, someone’s going to have to bring a lawsuit, and whoever does is going to win” unless the White House can show that Acosta is violent and disruptive. During Lyndon Johnson’s presidency, the Secret Service denied a credential to reporter Robert Sherrill of the Nation magazine. The agency said Sherrill, who had been in a fistfight with one of Johnson’s campaign aides, was a physical threat to the president. Sherrill sued and won in 1977, though he declined to apply for a pass afterward, according to journalist George Condon. Another possible parallel: A federal judge last year struck down Trump’s blocking of critics on Twitter. She ruled that the First Amendment prevented him from denying access to presidential statements due to a would-be follower’s opinions and views. It’s likely the courts will rule in CNN’s favor, and then we have to deal with the nauseating ‘we won’ attitude from the press, congratulating themselves for being the defenders of freedom and American republicanism. It’ll be gross—and we all know they haven’t won. We don’t care. All we saw was Trump beating Acosta with a belt on live television, an upper cut that broke bones. We like it. We’re not going to take it anymore, and we want to see more of it. So, soak it up, elite media. you’re incestuous relationship and feelings that you did something good stops within you small, insufferable, and condescending circles. CNN included a Secret Service agent as part of its lawsuit against the White House over the suspension of correspondent Jim Acosta's press credentials. The agent is only identified as "John Doe" in the official lawsuit, which also names White House officials Sarah Sanders, John Kelly, and Bill Shine, as well as President Trump himself. The lawsuit, announced Tuesday, names the agent as a defendant for blocking Acosta's access to the White House grounds.